At the last Cologne R user meeting Holger Zien gave a great introduction to dynamic linear models (dlm). 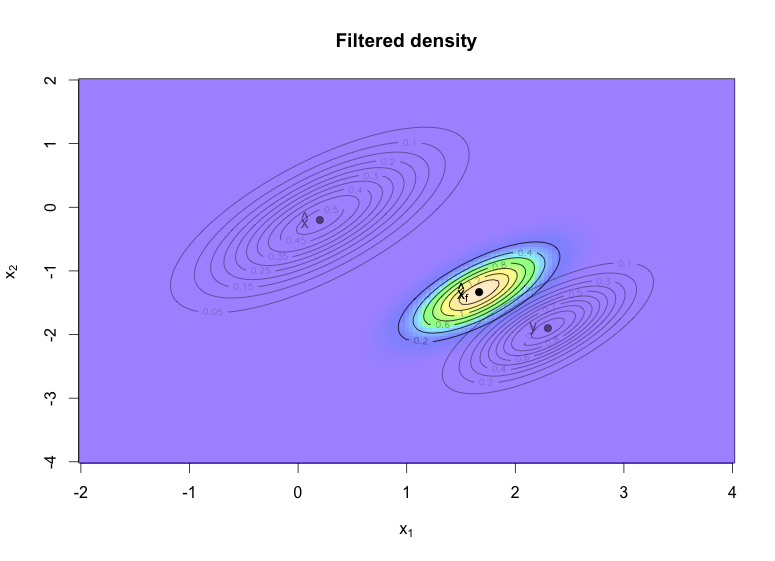 One special case of a dlm is the Kalman filter, which I will discuss in this post in more detail. I kind of used it earlier when I measured the temperature in my room. Over the last week I came across the wonderful quantitative economic modelling site quant-econ.net, designed and written by Thomas J. Sargent and John Stachurski. The site not only provides access to their lecture notes, including the Kalman filer, but also code in Python and Julia. 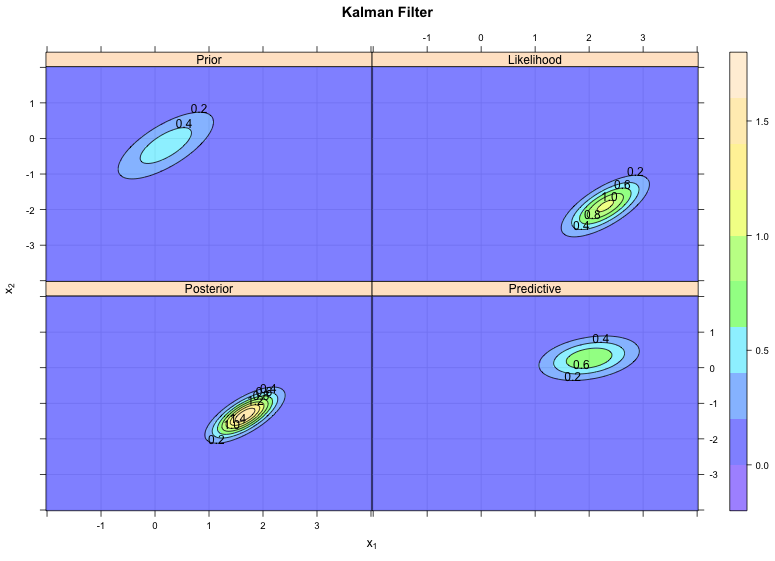 I will take their example of the Kalman filter and go through it with R. I particularly liked their visuals of the various steps of the Kalman filter. Suppose I have a little robot that moves autonomously over my desk. How would the robot know where it is? Well, suppose the robot can calculate from its wheel spin how far it went and an additional sensor (e.g. GPS-like) provides also information about its location. Of course both pieces of information will be imprecise. How can the various signals be combined? The prior distribution of the robot’s position can be visualised in R with a contour plot. The ‘GPS’ sensor provides also data about the location of the robot, again the sensor signal can be regarded as the expected position with some noise. Suppose the reading of the sensor is y=(2.3,−1.9). I will assume that the sensor signal has an error following a Normal distribution, with a covariance matrix R=0.5Σ. In my case G will be the identity matrix. Let’s add the sensor information to the plot. 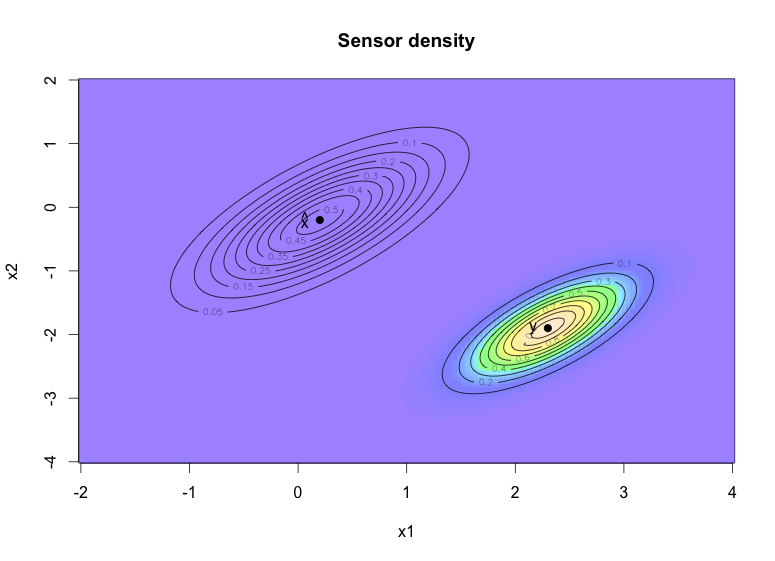 I have two pieces of information about the location of the robot, both with a Normal distribution, my prior is x∼N(x^,Σ) and for the distribution of my sensor I have y|x∼N(Gx,R). 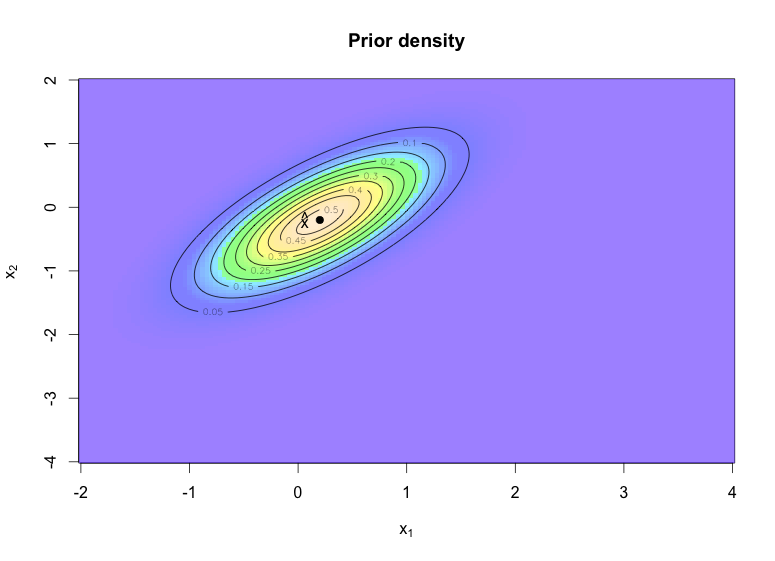 The updated posterior probability density function p(x|y)=N(x^f,Σf) is visualised in the chart below. 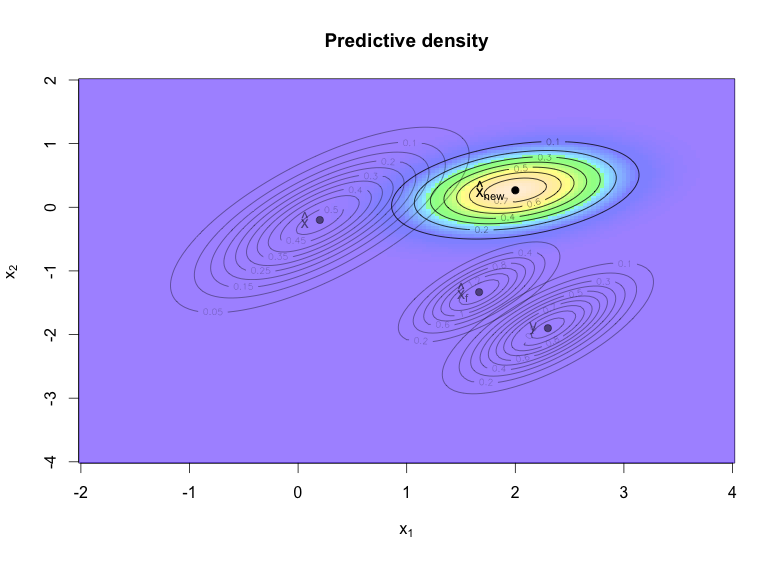 I can see how the prior and likelihood distributions have influenced the posterior distribution of the robot’s location. The sensor information is regarded more credible than the prior information and hence the posterior is closer to the sensor data. Ok, I have a better understanding of the robot’s position at time t0, but the robot is moving and what I’d like to know is where the it will be after one time step. That’s it, having gone through the updating process for one time step gives me the recursive Kalman filter iteration mentioned above. You can find the code of this post on Github.